In the latest blockbuster from producer Jerry Bruckheimer and director Gore Verbinski, the team behind Pirates of The Caribbean, Johnny Depp stars as Native American spirit warrior Tonto, taking audiences on an untold journey that will uncover a new side to the famed masked hero. Through a chance encounter Tonto is teamed with John Reid (The Social Network’s Armie Hammer), a staunch idealist with no time for the violent ethics of the frontier. Little does Reid know that this fateful encounter will set him on a whirlwind path transforming him from a man of the law, into a legend of justice. Despite their differences Tonto and Reid must band together, evolving into close buddies against all odds. The all star cast continues as the duo are joined by the feisty Red Harrington (Harry Potter’s Helena Bonham Carter) who proves women can hold their own in the wild, wild west. The 'The Lone Ranger' competition has now closed. Winners will be announced shortly. Competition opens at 5pm AEDT on Sunday 27th October 2013 and closes at 11:59pm AEDT on Sunday 3rd November 2013. Five winners will be chosen at random on Monday 4th November 2013. To successfully win, entrants must fulfil the above entry conditions before the time the competition closes. Current members/followers are eligible to enter the competition. Only one entry per person. Only one winner per household. To be a valid winner, the entrant must not have won a prize from SWITCH within the last 28 days. Each winner will receive one Blu-ray copy of 'The Lone Ranger'. By entering, you agree to receive occasional emails from SWITCH in the future. If you decide to unsubscribe from these updates, any further entries will not be applicable. Only Australian residents are eligible to enter. 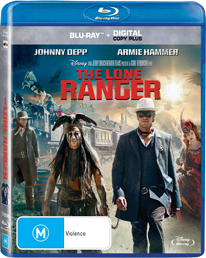 'The Lone Ranger' is available on Blu-ray, Digital and DVD on Wednesday the 30th October 2013 from Disney.